The meeting was constructive however. ATALYA, November 16. /TASS/. The meeting between Russian and US presidents Vladimir Putin and Barack Obama, held on the sidelines of the G20 summit on Sunday, was constructive, Russian presidential spokesman Dmitry Peskov has said. At the same time he warned against expecting a breakthrough in bilateral relations after such a brief meeting. “It would be absolutely unrealistic to expect a 20-minute meeting might herald a U-turn in bilateral relations,” he said. “These relations are what they are. So are the disagreements. But there is also the understanding the Russian-US dialogue has no alternative. That’s a hard fact,” Peskov said. “It would be wrong to think that twenty minutes is enough to overhaul bilateral relations, but the conversation was constructive, indeed,” Peskov said. Vladimir Putin and Barack Obama had a 20-minute informal conversation. The two leaders used a break between the meeting of the BRICS heads of state and the summit’s working session to have separate conversation. They took seats in front of each other and spoke tete-a-tete in the presence of their interpreters. 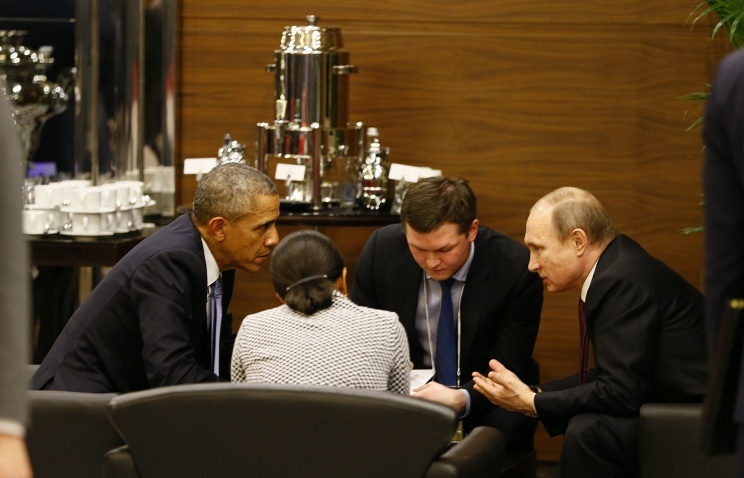 Putin and Obama had a full-format meeting in late September in New York on the sidelines of the UN General Assembly. That was their first meeting face-to-face over two years. Yuri Ushakov said earlier Putin and Obama had not planned a meeting during the G20 summit, though could not rule out their contacts on the sidelines. Next articleIsrael Behind Paris Attacks? I would think that they had a chance to commiserate about dealing with the RKM.